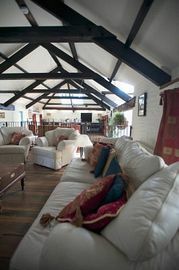 Glanafons 5 star self-catering Coach House is a large, inviting house, which starts with your welcome hamper on arrival. Along with its quirky features, you also get 24 acres of garden, grass tennis court, games field and 400 metres of private fishing on the Western Cleddau. All of this makes for a very private holiday, yet the county town of Haverfordwest is just 2 miles away. The beautiful Pembrokeshire Coast National Park with 186 miles of walks and beaches are easily accessible, as are the stunning Preseli Hills to the North. An ideal base from which to explore or relax in Pembrokeshire. Glanafon Coach house was built in circa 1830 and sits behind and within the grounds of Glanafon Manor, a grade 11 listed Georgian manor house, built we believe by William Owen. 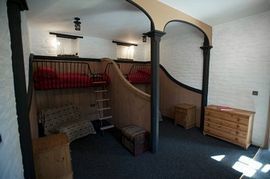 The Coach House has retained many of its original features and down stairs, the single bunks and beds have been fitted between the original four horse stalls. The double bedrooms with roll top baths are accessed off the stalls. The property is suitable for up to four adults and four children. The ground floor includes a double bedroom, in shades of crimson with doors leading out onto the garden. Free standing Edwardian style bath tub with wash basin. Wardrobe and chest of drawers. 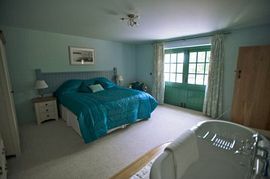 The second double or twin bedroom (the Blue room), also features doors which lead out onto the garden, with country furniture and Edwardian style bath tub. Shower Room with toilet, basin and mirror, original stone feature wall and flagstone floor. Toilet with basin and mirror. Utility Closet with washing machine, vacuum cleaner, ancillaries. Double height open plan lobby which opens out onto garden. Stairs ascend to first floor. Original horse stalls include 2 x 6ft upper bunks accessed by ladder within the original stall work. Beside tables, Chest of drawers and 22inch HD TV-DVD-Freeview. On the opposite side are more horse stalls which include 2 x 6ft Divan beds within stall work, bedside tables, mini wardrobe and 22� HD TV-DVD-Freeview. The first floor shows the charm of this old building, with exposed timbers and open plan design. The entrance lobby is accessed by internal or external stairs. The entrance lobby either leads down to the bedrooms or wash rooms or on either side lay the open plan lounge and dining room. 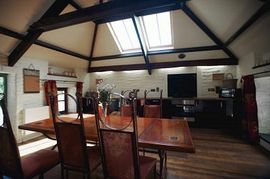 Character wooden ceiling beams, half doors and traditional low windows add charm to the lounge. Leather lounge suite, coffee table, lamps and 32inch HD TV-DVD-Free view. Fully fitted kitchen in black gloss features, Fridge, Freezer, Dishwasher, Electric Cooker with Hob and microwave. Dining table with seating for eight people. Half door to kitchen also has external stairs to ground. 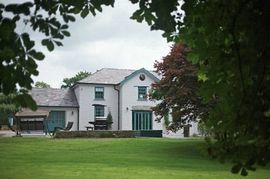 Glanafon self-catering accommodation comes with 24 acres of Glanafon Manor grounds featuring grass tennis court, games field with football posts, 400m of Western Cleddau river fishing, walks and woodland, to which the guests have full access. Their private patio features garden furniture, BBQ area, lawns and woodland walk. Travel Cot and high chair provided. Themed decoration � Easter, Xmas etc. 400 meters of private River Fishing. Games Field with Football Posts. Quirky Coach House in Pembrokeshire. Garden includes Games Field, Tennis Court and River Fishing. Local Services: The nearby town of Haverfordwest has all the essentials as well as a great farmers markets and selection of good pubs. History buffs will enjoy the many castles such as Pembroke (birth place of the Tudors) and the many glorious gardens, while Folly Farm. Oakwood Park and Blue Lagoon Waterpark are great for families. Situated on the outskirts of Haverfordwest, Pembrokeshire�s county town, Glanafon Coach House is set within the private gated grounds of Glanafon Manor. From the M4 follow the A40 to Haverfordwest. Approx 1 mile from Haverfordwest you will pass The Golf Club on your right and shortly afterwards approach Scotchwell roundabout. Turn right towards Fishguard.